Image caption The statue will show Kevin Beattie's "power" and "strength"
The first images showing how a statue in honour of former England and Ipswich Town footballer Kevin Beattie will look have been revealed. The central defender, considered one of Ipswich's greatest players, died from a heart attack in September, aged 64. Sculptor Sean Hedges-Quinn said he designed the bronze statue to capture "The Beat" in his prime, showing his "strength" and "power". It is due to stand close to the club's Portman Road ground. A fundraising campaign, called The Beat Goes On, was launched by BBC Radio Suffolk in conjunction with the East Anglian Daily Times (EADT) and Ipswich Star newspapers in December. More than £49,000 has so far been raised towards a £110,000 target for the memorial, which is expected to be sited near the existing statue of former Ipswich and England boss Sir Bobby Robson on Portman Road. Also nearby is a third statue by Mr Hedges-Quinn, of another former Ipswich and England manager, Sir Alf Ramsey. He said he decided to show Beattie leaping for a header to highlight his "power" and "strength, agility and athleticism". 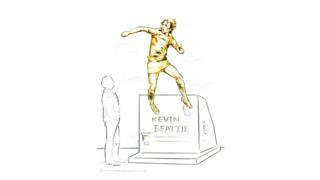 Beattie will "float" in front of a plinth, about 4ft (1.2m) in the air, using steelwork attached to one of the statue's legs. "I wanted a statue of great movement and pose, which says he wasn't just a footballer, he was a beast of a player," he said. Brad Jones, editor of the EADT and Ipswich Star, said he was "thrilled" with the design. "Any fan who watched the Beat play for Town will recognise that Sean has captured his power and strength perfectly," he said. BBC Radio Suffolk's Mark Murphy, a close friend of Beattie, said: "I must admit I shed a tear when I saw the sketch for the first time. "I'm so looking forward to seeing the finished article."